Late Mr. Moin Akhtar –a true legend, was unarguably Pakistan’s best entertainer. He was loved for providing humor for people of all ages, and with an etiquette that remained unmatched. He is an inspiration for the generations to come and became a creative powerhouse that stood in front of all acting maestros of south Asia. With his end came the end of an institution. We as a Professional Theater and Dramatics group feel great pride in paying Tribute to the Pioneer of Comedy Theater. This is a Theatrical Drama Performance by Drama Mafia in their typical style paying their respect and gratitude filled Tribute to the LEGEND Mr. Moin Akhtar. 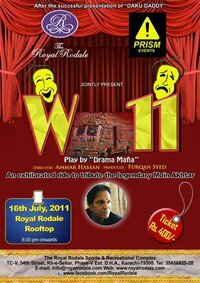 The performance W-11 consists of a talk show and a mushaira which will definitely make the audience laugh like anything!!! Ticket price: Rs 400/- only! !